Every year, I try to run at least one 5K with my nephew. In the past, we have run the Bronx Zoo and Giants Stadium together. This year, we wanted to run the vaunted halls of the house that Ruth built, Yankee Stadium. I also decided I wanted to give Google Glass a serious test and decided to wear them and record the run. Due to differing run times of our team, we were put in the 9th heat, which started at 10:40 AM. We picked up our bibs and prepared to run around inside the stadium. Prior to our heat, we were allowed in to gate to stretch and get prepare before heading towards where we would be running. They counted down and with a start, we headed out around the hallway at the field level behind the seating. While we did two loops around at that level, my eleven year old nephew was able to keep up with me for almost a full loop before deciding he could no longer keep up that pace and dropping back to a better pace for him. After looping around a second time, we headed towards the ramps that led down into the bowels of the stadium that are normally only accessible to those who work there. It led out onto the field where we were able to run around the warning track on the field at Yankee Stadium, which is always the best part to any Yankee (or baseball) fan. Twice around the warning track led back up the ramps to the stairs that led to the third level, around the third level to more stairs to the fourth level, which we crossed to ramps down to the field level. With the finish line in sight, we were pointed to the right to run up stairs back to the third level and fourth levels again and back down the ramps to finally cross the finish line. 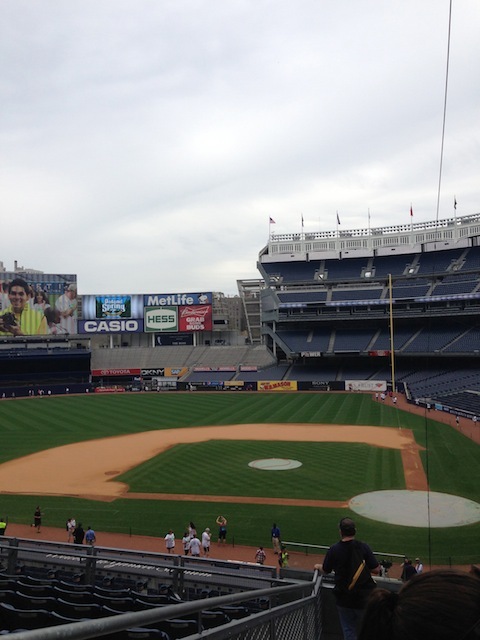 With all the ramps and stairs, the Damon Runyon Yankee Stadium 5K is not a race to PR on. My time was 28:32 and my nephew’s time was 38:15, which I thought was impressive. As a Yankee fan it’s always fun to race through Yankee Stadium, and I know my nephew enjoyed it as much as I did.